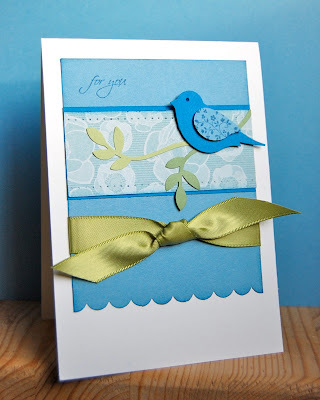 Stampin' Up ideas and supplies from Vicky at Crafting Clare's Paper Moments: Two step bird punch note card - new colour! Two step bird punch note card - new colour! I think it looks fantastic with touches of another new blue, Pacific Point, and a couple of the greens. The designer paper is one of the subtle ones from the stunning Greenhouse Gala pack - I can't wait to show you more from that range! Cut a sheet of A4 Whisper White in half vertically, score and fold to make a card blank. Cut a piece of Marina Mist card stock 12cm x 8.5cm. Scallop the bottom with the scallop border punch. Cut a strip of designer paper 3cm x 8.5cm and pierce a border along the width at the top and the bottom using the template in the mat pack. Mount this onto a piece of Pacific Point card stock cut 3.5cm x 8.5cm. Position the designer paper strip on the Marina Mist card stock without glue so that you can judge where your sentiment should go. Stamp the sentiment using a stamp-a-majig for position, then go ahead and attach the designer strip to the Marina Mist. Knot Old Olive satin ribbon round the bottom of the Marina Mist card stock and fix the panel to the card front. Cut a bird out of Pacific Point card stock, a wing out of Marina Mist card stock and two branches, one out of Old Olive and the other out of Wild Wasabi card stocks. Stamp a floral design on the wing using Pacific Point ink and attach it to the bird with a dimensional. Glue the branches to the designer paper strip and sit the bird on top with a dimensional. Hope you all had a great weekend. My lovely sister and her small son came over yesterday and it was a warm afternoon so, after lunch, we walked to a local park so that the younger members of our party could let off steam. At one point I overheard one of the dads asking his toddler to move from the foot of the slide so that my nephew could use it. "We need to let the little boy come down," he explained. This enraged my nephew. "I'm not a little boy!" he said with dignity, "I'm four years old!" See you tomorrow for more new colour inspiration. I'll be CASEing this layout!.....lovely!! What a great design to showcase the bird and new colors. The more you show that DSP, the more I think I may have to get it myself. I wasn't sure about the large prints for cards but you really make them work. Isn't it funny how kids always want to act/be older than they really are. This card is so calming and peaceful with the blues and greens. Makes you feel more relaxed just looking at it! Ah -- 4 years old. Probably my favorite age of all. They have such a "can-do" spirit and certainly are not "little" anymore! Love that age!